You know I love my Polycrylic. I talk about it all the time, and I even wrote an article some time back about why it is my favorite finish for acrylic paintings. But there are always more finishes to try and today I’ll give a couple of spray finishes a try. I love the thicky glossy finish I get on my paintings with the Polycrylic, but I see people in the group using all sorts of things to bring back the color and gloss to their dried paintings, so a trip to the art section of my local stationary store produced these two possible candidates. I picked both because of their UV protection, something not offered by my usual finish, but valuable to have in a sunny climate here in the Caribbean. Despite being almost $30 a can here in Cayman, these both sell for less than $10 on Amazon. Ouch, I feel taken advantage of but that’s no surprise here in Cayman. Both have all of the usual warnings and precautions that you would expect to find on spray paints such as using them in well-ventilated areas, not breathing the fumes, not to use while smoking etc. I chose to spray mine outside which was a bit inconvenient but better to be safe than sorry. I tested these two sprays on some painted tiles with my usual Polycrylic as a comparison. I gave each 2 coats of the spray. Each of the tiles was cleaned before I sprayed, using the same method I would usually use for the Polycrylic Finish. Check out the video to see my results and how each one performed. So there you have it. Both were very different. The UV-Resistant Clear really didn’t look glossy at all. Even after two coats I could barely tell there was anything on there at all except it looked like it was covered in a fine mist. Each and every tiny spray particle was visible. Maybe I didn’t spray it liberally enough for each coat, but the can did say that multiple thin coats were recommended. It did, however, look much better after just one coat of the Polycrylic, two coats would be even better. The Conservation Varnish was strange. The first coat was fine, smooth and glossy and after just one coat I was already impressed. Then the second coat separated really badly leaving a bumpy finish as if it were reacting with silicone in the painting, even though the first coat had dried smooth. I just didn’t understand that at all. The second test I did revealed more where the first two thin coats were just fine, very smooth and glossy, but when I tried to add a thicker final 3rd coating, it gave that separated and bumpy surface again. Clearly, this varnish doesn’t like being applied too thickly. Conclusion: I like the added benefits of the UV Protection that both sprays provide. The Conservation varnish gives a super glossy finish and I like it a lot, but you have to be careful to only use thin coats or you’ll get that separation. The UV-Resistant Clear isn’t so glossy and shows every fine particle from the spray, like a mist, but that does improve with a coat of my regular finish over the top. I think I would use that one again – two coats of the UV Resistant and then two coats of the Polycrylic to get the benefits of each. 1.Acrylic takes 4 to 6 weeks to cure, depending on humidity. 2. UV is just that. Not a varnish. 3. Conservation varnish, and any spray for that matter, needs to be applied in look humidity weather. 4. Wait 24 hrs or more in between spray coats. 5. Shake the cans more than the recommended 2 minutes. Hi Kay, I’ve got some simple steps for cleaning here. I brush off the powder with a dry cloth or soft brush first, then use a wet wipe to get off everything. So I’ve been using Polyacrylic for a little while now, and like you, I absolutely loved the results. However, recently I used it on a few of my canvases that I plan on selling at a boutique next weekend, and the polyacrylic layer cracked. i think the painting itself is fine, but I am wandering what I did wrong this time around? The tempture is starting to drop now , so it is colder in my house. Could that be the difference? Should I be running the heater to keep the temperature of the house a little warmer? I’m just a little bummed about this and hesitant to put it on the other canvases that are cleaned ready to be finished. Any tips? I recently had this too. I’ve been using it for months, all without incident, and then in a varnishing session last week, just one of the paintings had a slightly crazed or crackled look once the first layer dried. I really can’t say why that happened. There was nothing different about that painting. It was done at the same time and the same conditions as the others. Its the first one I’ve ever had and its a mystery why. We’ve discussed it in our chat group, and can’t seem to work out why this happens from time to time. Sorry I can’t offer any substantive advice, other than to commiserate with you. 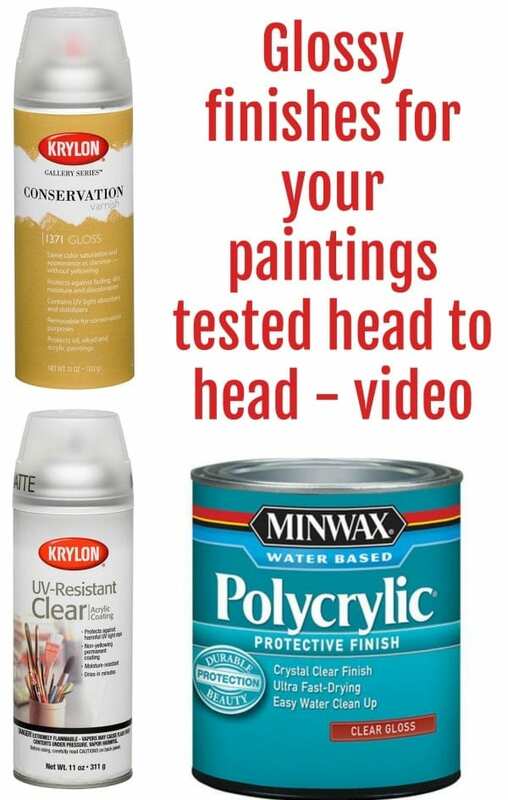 Greetings all…I have tried both the spray Minwax Polyacrylic and the paint can, brush on product….I prefer the brush on but I continue to get brush marks from application. Any thought? Is a sponge brush better than a bristle brush? It’s most likely that you are not putting it on wet enough. Get both the brush and the surface nice and wet, and then as you pass the brush over, the product smooths out behind the brush and dries to a smooth glossy finish. I find I only get brush strokes if its a bit dry. Thanks…nice and wet with lots of varnish, I suppose? Will try that…. Merry Christmas to all! Has anyone tried pouring one color and letting it fully dry (on one part of a canvas) then pouring another color and the remaining unpainted section of the canvas? If the two colors run into each other, does the top paint adhere to the under color or will it peel or crack later? Want to tilt in two different directions with the 2 colors and this is the only way I can figure out how to do that. Thanks for the wisdom of your experiences! Today was my first shot at pour painting. After watching and reading a lot on the net.) It seems I got my paint the right consistency after doing different mixes But it’s either bubbly or is chunky, I can’t tell which yet – maybe both . I felt like I stirred it enough. I’ve used various mixes with the paint… water, rubbing alcohol, turpentine, glazing medium. What am I doing wrong/what’s happening? Is there a perfect recipe or recipes? Do you have a studio in Grand Cayman. I’m going there for a week at the end of April and would love to meet you/see your work. I’d love to pay for a teaching session if possible.